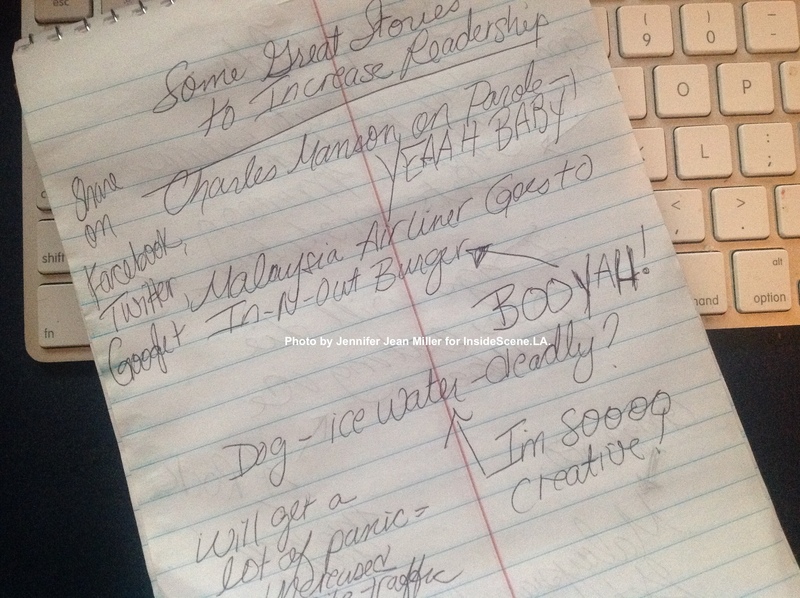 How I envision a Satire Reporter’s notebook to look like. Photo by Jennifer Jean Miller for InsideScene.LA. In my last post, I discussed the impact of one hoax news story, involving the reputed release of Charles Manson on parole. While some sites are evidently cranking out hoaxes, other satirical sites are walking a fine line. They generate stories that are hoaxes yet some are not overly outrageous or obvious, so they slip under the radar. I am not against satire and fun…grew up in the generation that embraced MAD Magazine…and Wacky Packages…the satire stickers with the invented products (ie a sticker of “Weakies” that spoofed on Wheaties and other popular brands). Humor is awesome and we need it in our lives. However, when publications are causing hysteria with their “humor,” when it’s not recognized as satire, these satire sites are missing the mark and have lost sight of their missions to entertain. Things are no longer funny in that case. In return, unsuspecting readers are duped…and even other publications are fooled, and may even syndicate the fable as fact. I was on a friend’s Facebook Page, who was outraged over a story in a particular community about an Arby’s restaurant, that the restaurant refused to serve a particular segment of the population. This friend grew very upset, as did people on the same thread. As it turned out the Arby’s story was a fabrication and featured on one of these satire sites. Below, I have chronicled some satire sites that readers should look out for and take stories with a grain of salt. Additionally, some urban myths themselves, which have been flying around the Internet news waves and Facebook feeds. The Onion – this is a well-known satirical news site published weekly. If you Google “Satire News Sites,” you will see The Onion come up first…and it is truly filled with satire and fun. If other satire sites are going to do it, they need to do it right like The Onlon does. The site is loaded with disclaimers and it borders on the outlandish, so there’s no disguising that this is a satirical publication. The Daily Currant – this is one site that others have been fooled from. In fact, one of the stories, about a Christian boy dying for a few minutes and then meeting Allah, is one of those spoof stories that a few on my Facebook friends’ list, actually believed. Empire News – This news outlet is the one I went on the rant about with their phony story about Charles Manson being paroled. ‘Nuff said. Other writers have been up in arms as well about this topic, if you Google, “Empire News Charles Manson.” To show the power of the “press,” this site incited a rumor that ended up with over 10,000 shares on social media sources, without it being a legitimate story. As one person asked on one of the debunking articles, why anyone would start such a rumor that would be about such an emotionally charged topic is stupid. What even comes up in Google, is unbelievably, chatter about this topic on the “official” Facebook Page for Charles Manson. I am appalled that this guy even has his own social media site and website…sickening! And leads to even a legal fund for Charles Manson, accepting donations and getting a copy of his art for a donation of $25 or more. A crazy fake article has unveiled more craziness like this because now Chucky’s site has commented on the phony report and it’s landed in Google, to unveil his puke, like info about his CD for sale, interviews, requests for money, photos of he and his girly, requests for more money…info about his non-profit organization (what??? )…request for more money…then their excrement about how “CM” as he is referred on his website, has been subjected to decades of torture, substandard care, denied First Amendment rights, and discriminatory treatment (let me take out my smallest violin in the world to strum the blues for him, since what he experiences pales hugely in comparison to the death he incited). Another site, Before It’s News, syndicated this fake report as well as fact. See the Pandora’s Box something like this can open up? Empire News even disseminates their vomit in their sports site (although one story I will admit would be sweet justice on this site is Michael Vick hospitalized for a pit bull attack…another one myth busters had to remediate on the net since, like the story about Charles Manson, it created chaos and questions). Cap News – Here’s another one, that is evidently a humor site, but ripped the logo from ABC. The Weekly World News – I remember laughing at the absurdities about this publication when I was a kid, as the stories are so “out of this world” (like their headlines about alone abductions and more, seems to be their specialty). Somehow, this outlet has survived and made its way to a web only format. Obviously, sites with names like The Hummus, SatireWire, GomerBlog and SportsPickle are giveaways…with many others, as described above, proceed with caution. Then again, not every site that spreads rumors is a satire site. Just recently, a blog stated very passionately and seriously that people should not give their dogs ice water to drink, as it can cause stomach problems and kill them. This trivia has continued to circulate, in spite of major news outlets reporting on the hysteria and worry that it has caused for pet owners. Like what you read here? Stay on the scene, with InsideScene.LA…and click here to follow us on Facebook.